How do Students review a document assessment? How do Instructors review a document assessment? Why is my document score or document scoring inaccurate? I received a “queued” message instead of a score after uploading a document assessment. What does this mean? I received an error “Error -1” when uploading my document assessment. What does this mean? 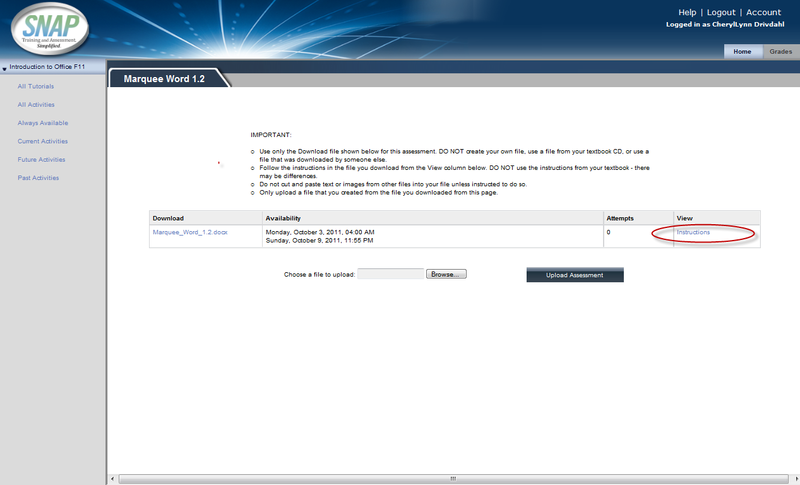 I received an error “Error -2” when uploading my document assessment. What does this mean? I received an error “Error -3” when uploading my document assessment. What does this mean? 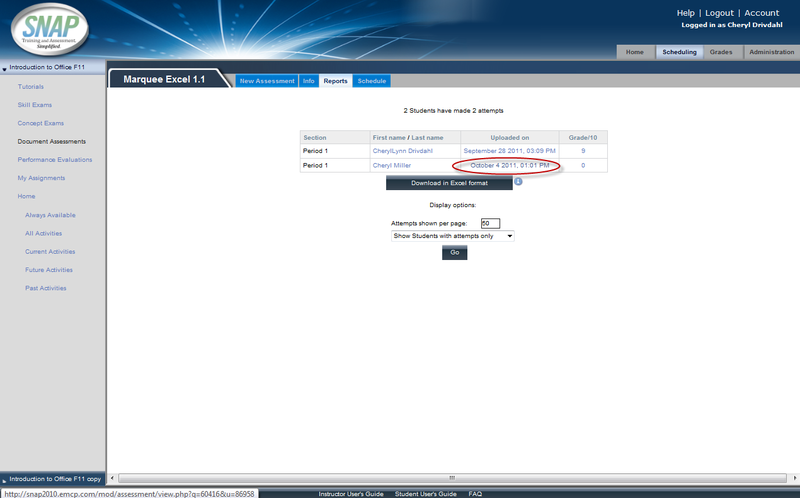 I received an error “Error -4” when uploading my document assessment. What does this mean? I received an error “Error -5” when uploading my document assessment. What does this mean? What does the SNAP Document Assessment score mean? The SNAP Document Assessment Checker calculates the number of differences between the beginning Download document (base file) and the Model Answer. The SNAP Document Assessment Checker calculates the number of differences between the student’s uploaded file and the Model Answer. The SNAP Document Assessment Checker divides #2 from #1, subtracts this amount from 1.00, and represents this score as a percentage. In addition to a percentage score, the SNAP Document Checker generates a Results file that shows what is different about the Model Answer when compared against the student’s file. 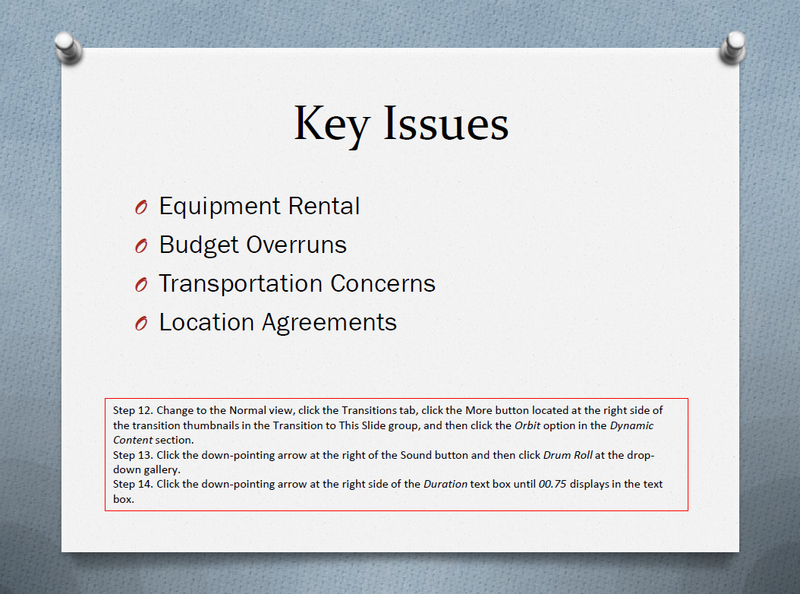 You will now see the Document Assessment Info screen. In the View column, click Instructions to display the Instructions that were to be followed in preparing the Submitted File. You may want to print the instructions for ease of reference. 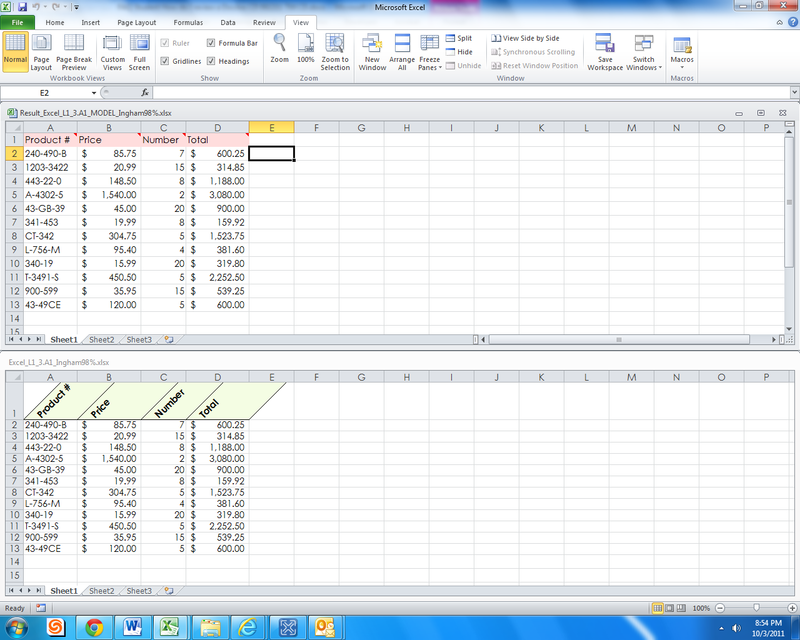 You should now see the Results File and Submitted File side by side . 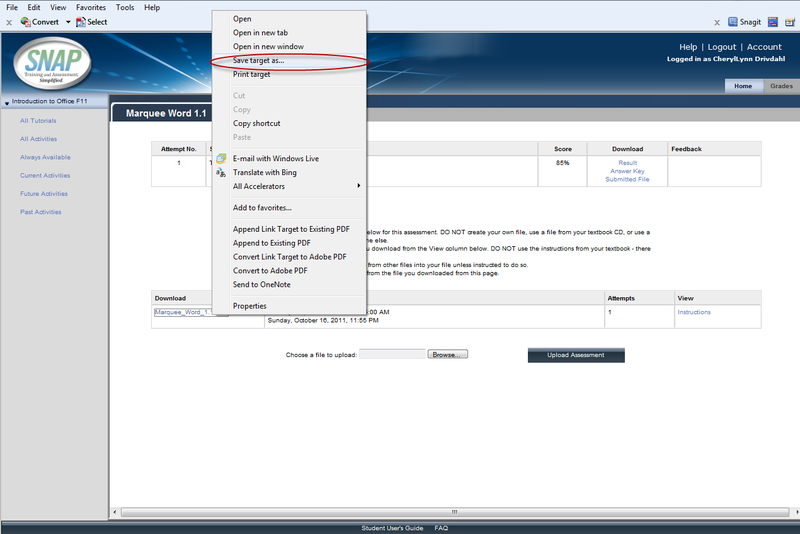 In both the Results File and the Submitted File, select the Home tab and then select the Show/Hide button in the Paragraph group. (This button is colored gold when it is selected.) 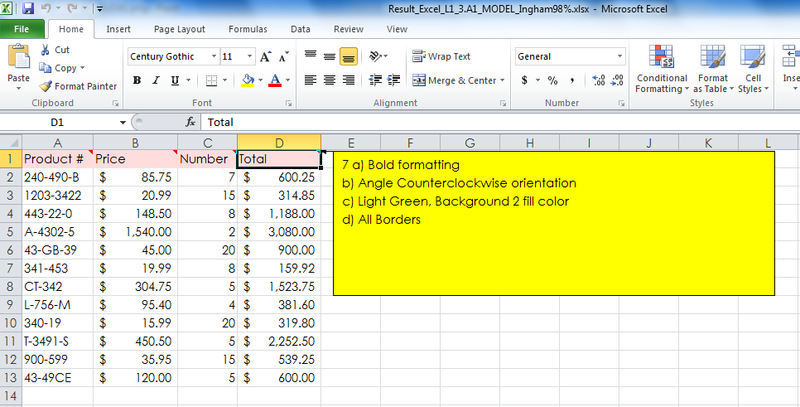 Selecting the Show/Hide button will reveal nonprinting formatting characters that need to match those in the Model Answer. If you see this dialog box , select the Submitted File. You should now see the Results File and Submitted File on your screen ..
You should now see the Results File and Submitted File on your screen . This simply means that your document is still being graded, and a score will be available when grading is completed. How do I interpret the SNAP Document Assessment score? 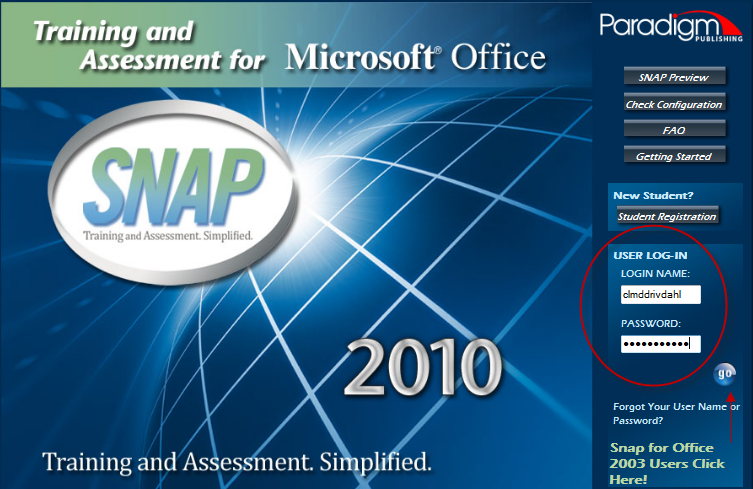 When a Document Assessment is completed and uploaded to the SNAP Web site, SNAP generates a percentage score. This score indicates the percentage of changes that were successfully completed to make the Submitted File match the Model Answer. 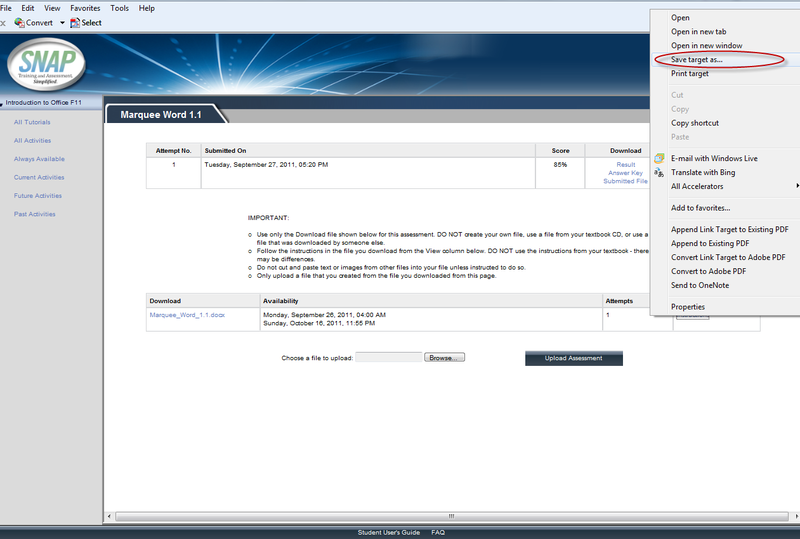 In addition to the percentage score, the SNAP Document Checker generates a Results File that shows how the Model Answer differs from the Submitted File. 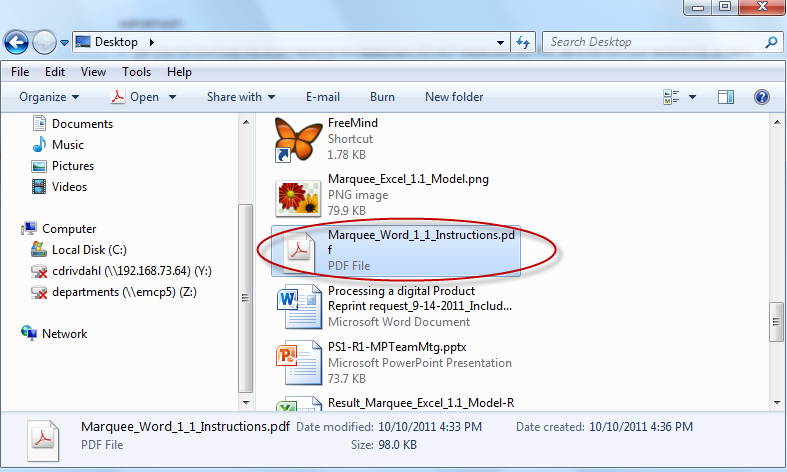 Word Results File – How do I interpret the Results File for a Submitted Word Document Assessment? 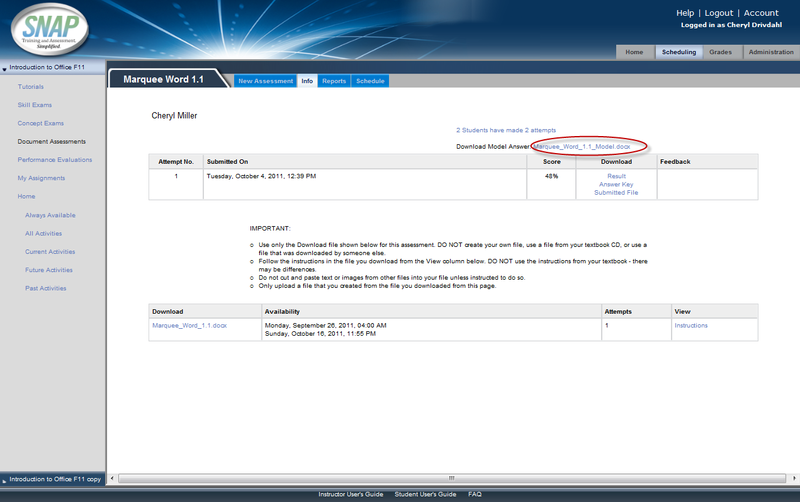 In the View column of the Document Assessment Info screen, click Instructions to display the Instructions that were to be followed in preparing the Submitted File. 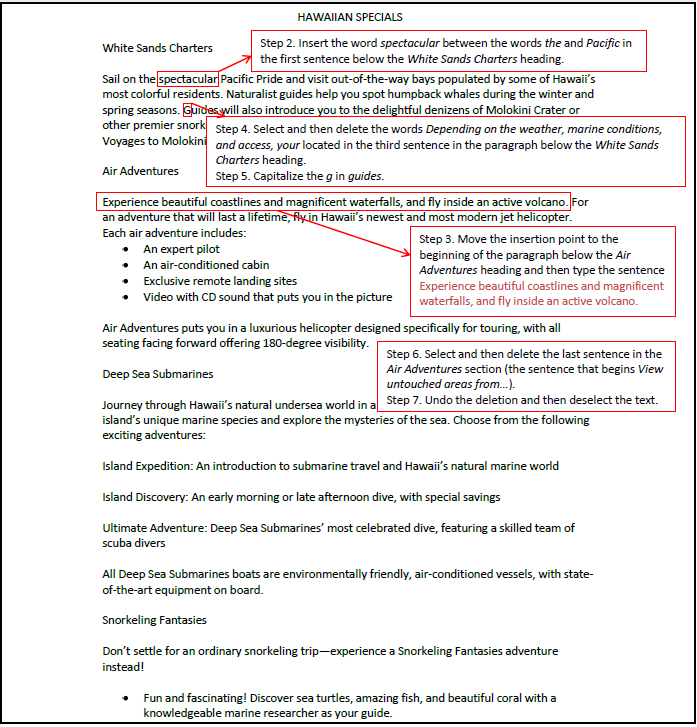 You may want to print the instructions for ease of reference. In both the Results File and the Submitted File, select the Home tab and then deselect the Show/Hide button in the Paragraph group. (This button is colored gold when it is selected.) 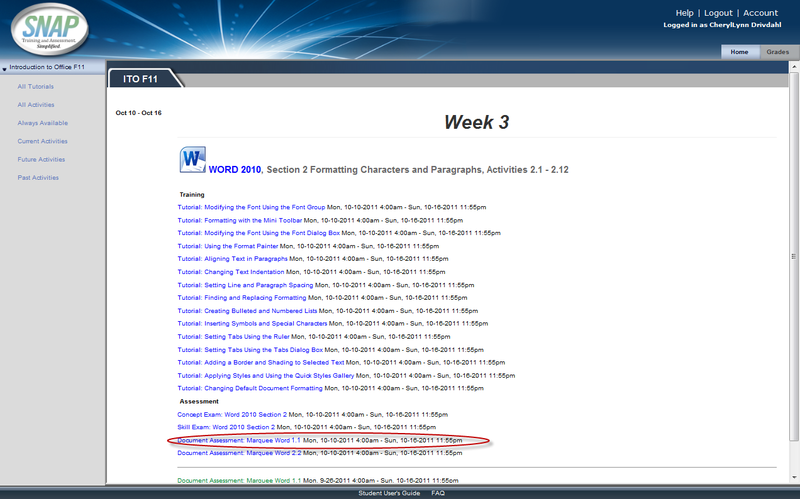 Selecting the Show/Hide button will reveal nonprinting formatting characters that need to match those in the Model Answer. Now compare the Submitted File against the Results File. 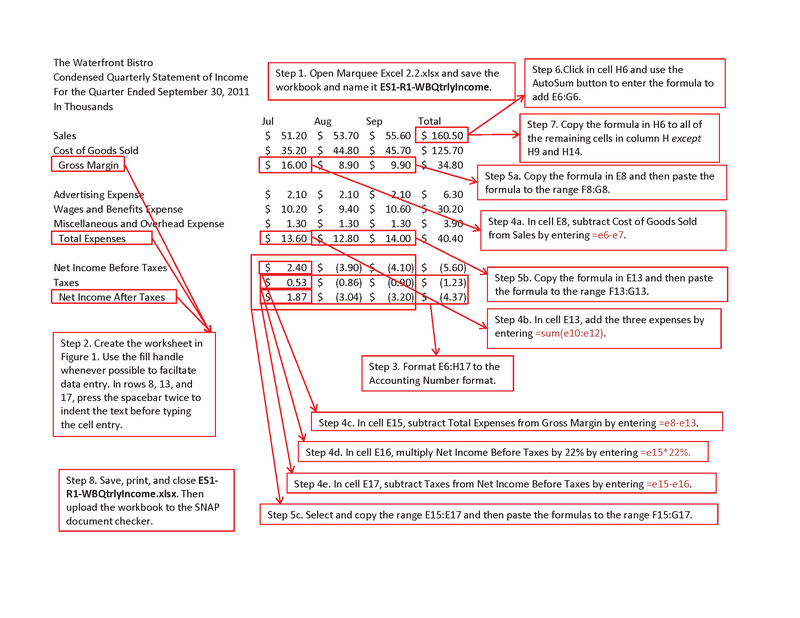 The Results file shows the Model Answer with tracked changes and marginal notes indicating how the Model Answer differs from the Submitted File. For each difference illustrated in the Results File, refer to the Instructions to see specifically what you were to do to make the Submitted File match the Model Answer. The Answer Key provides a detailed markup of the Model Answer with annotations on each change requested by in the Instructions. 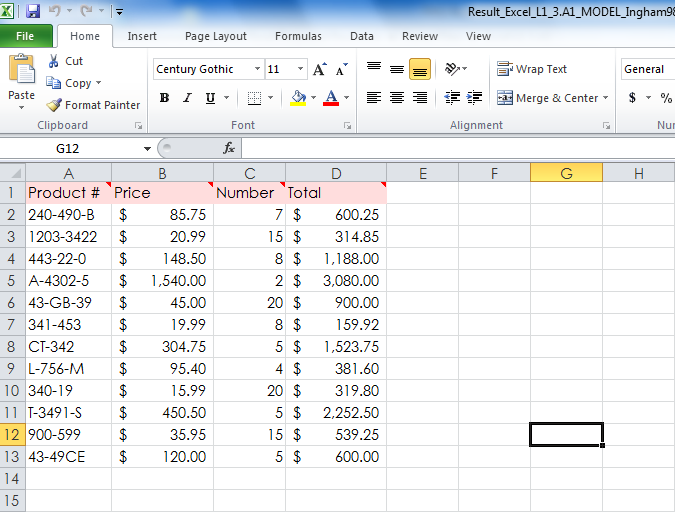 Excel Results File – How do I interpret the Results File for a Submitted Excel Document Assessment? 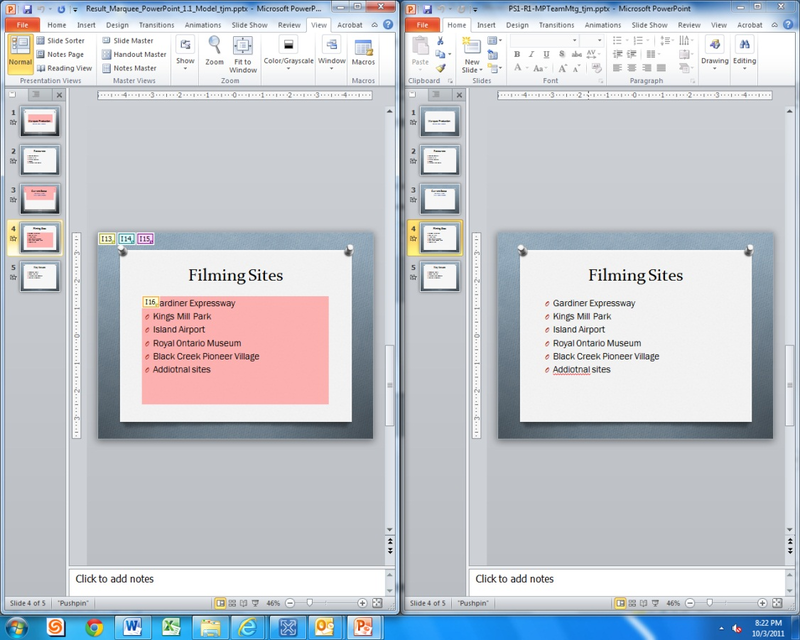 PowerPoint Results File – How do I interpret the Results File for a Submitted PowerPoint Document Assessment? 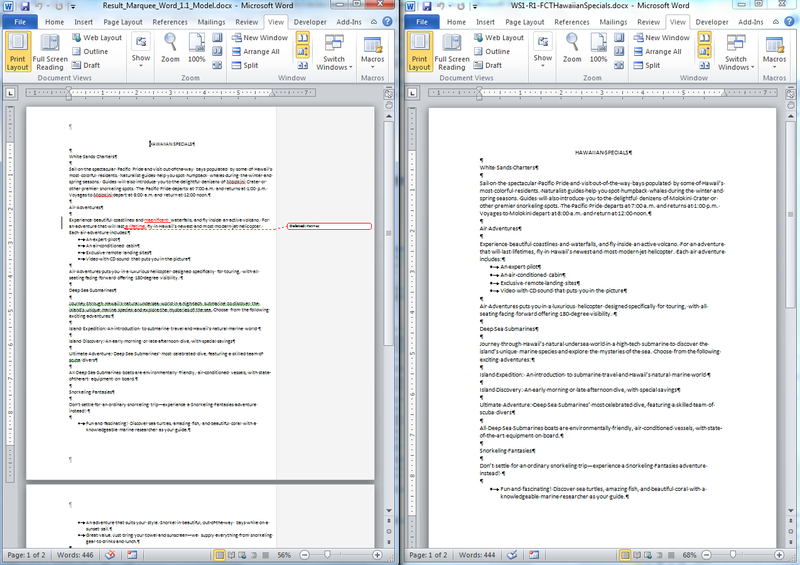 You should see the Results File and Submitted File side by side. Clicking a comment field on a highlighted slide opens a box describing in general how the Submitted File is different. How do I complete a SNAP Document Assessment? Log into your SNAP course, at the Home page, click the name of the Document Assessment. On the Document Assessment page, follow these instructions to download the Document Assessment. Right-click the file name. in the Download column. Leave the default file name. Select your desktop or another location to save this file on your computer. Right-click the Instructions link in the View column. Select your desktop or another location to save the file on your computer. Locate the Instructions file on your computer. 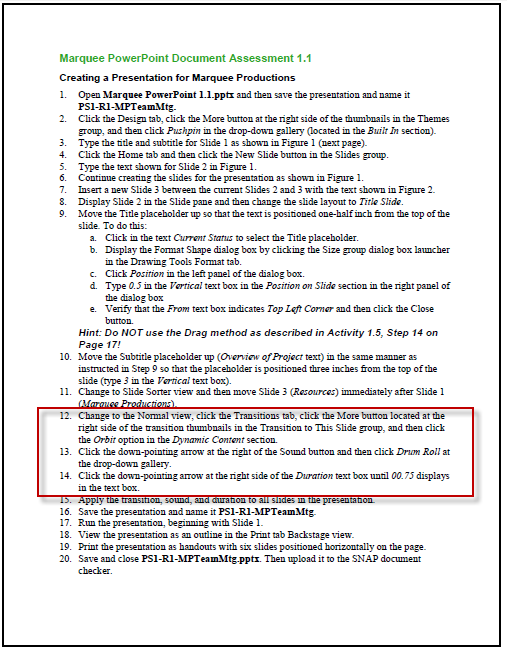 Either print or minimize the Instructions file. If you minimize the file, you can toggle back to it using the Instructions icon in the task bar at the bottom of your screen. 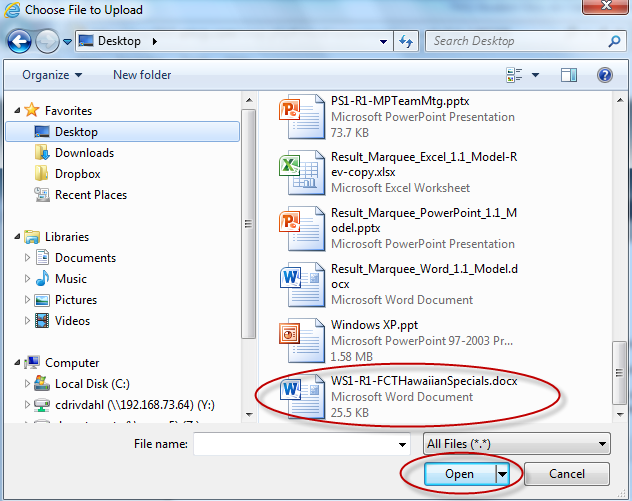 STEP 3: Perform tasks detailed in the Instructions file and save file. 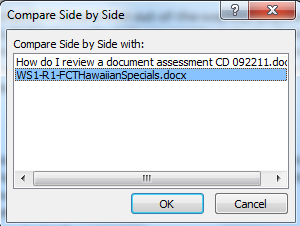 Locate the Document Assessment file that you downloaded from SNAP onto your computer, select the file, and double-click the file to open it. Make changes to the Document Assessment file according to the Instructions. NOTE: Read the instructions carefully, and follow them exactly. After finishing the tasks called for in the Instructions, save your file on your desktop or another location on your computer. 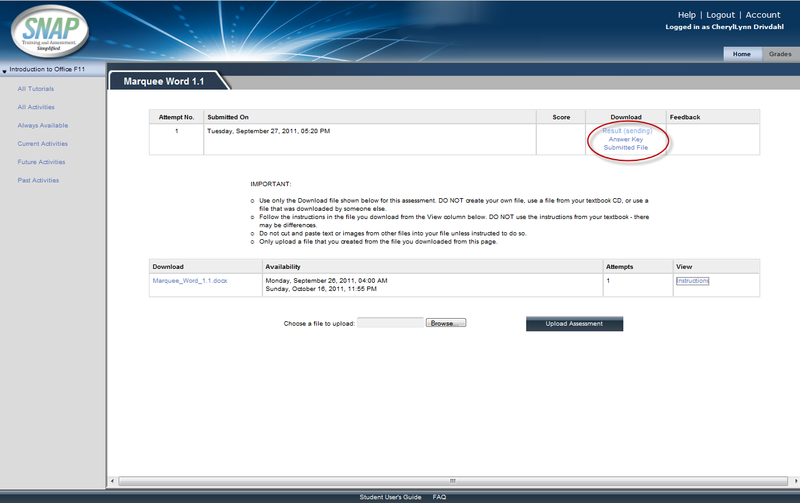 STEP 4: Click Browse, find saved file and then click Upload to submit for grading. 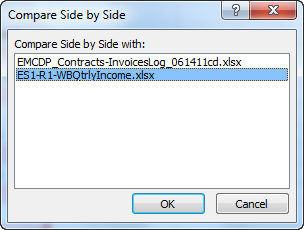 Use the dialog box that appears to find your completed file on your computer. 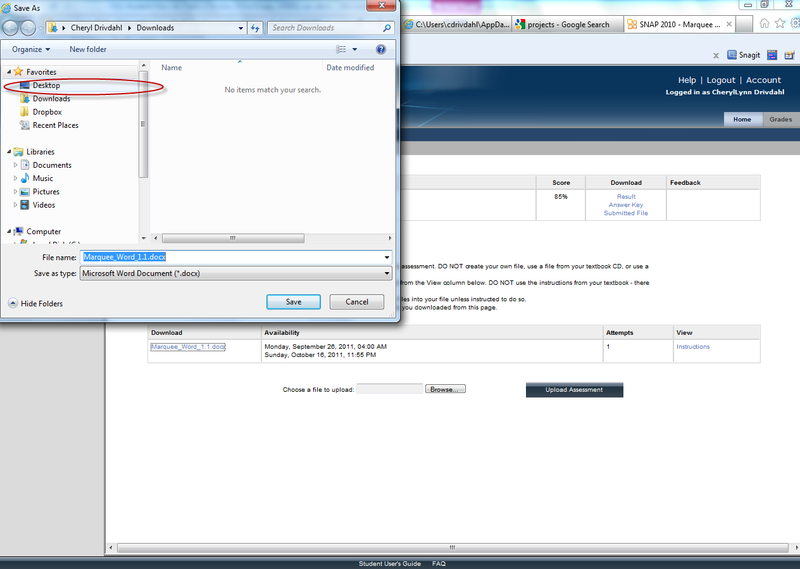 Then select the file, and click Open. Click the Upload Assessment button. NOTE: A link to your Submitted File will appear at the top of the screen, along with links to the Results file and the Answer Key file. When you first submit a file, the Results file link will say Results (Queued) or Results (Sending) or Results (Comparing). Click this link or refresh the Document Assessment Info page. You will then see your score in the Score column, and the Results file link will no longer say (Queued) or (Sending) or (Comparing). If you click the Results file link, you see your actual Results file. For help interpreting your results, see the FAQ How do I review a Document Assessment? If you believe that the scoring is inaccurate for a document assessment, please consult with your instructor. It is not possible to delete document assessment attempts. 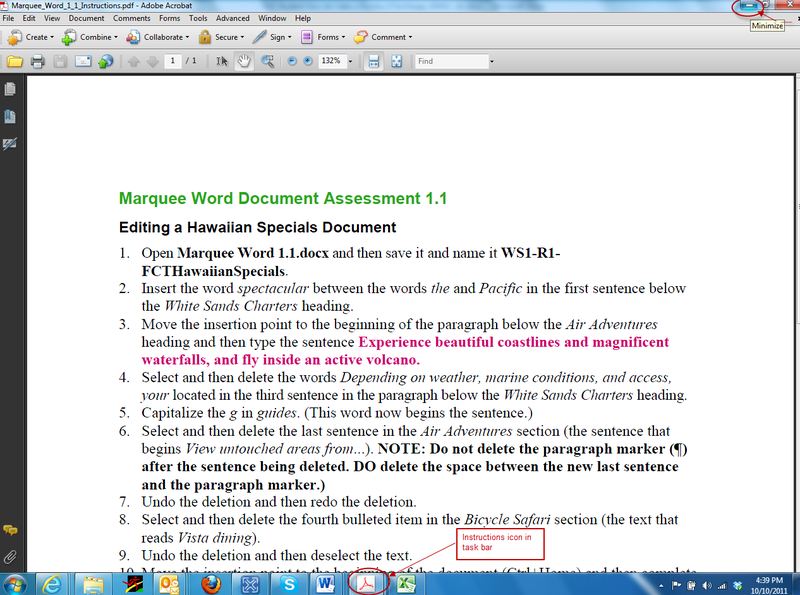 The file was not edited in the 2010 version of Microsoft Office. If your attempt to upload a document results in the “Error -5” message, it means that the Document Checker could not score the document. This happens when the Document Checker engine is not responding, or the file is not a valid Microsoft Office 2010 (.docx) file. Please make sure that you have only opened and edited the file in Microsoft Office 2010. 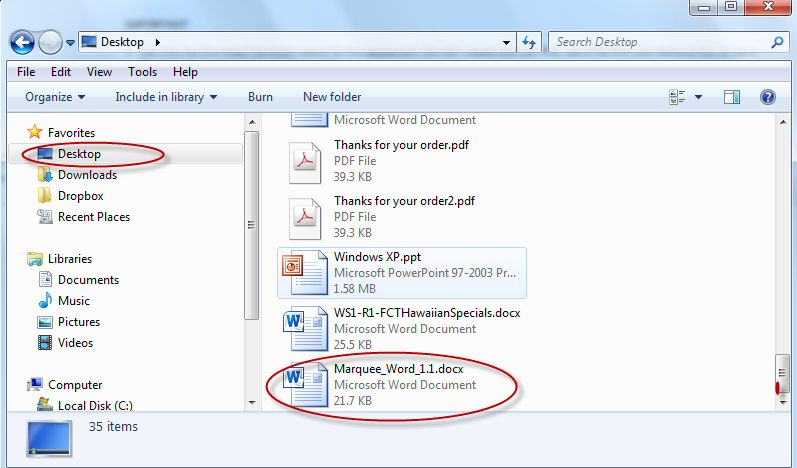 Please be sure that you save the file as a Microsoft Office 2010 file and not any other file type. The solution is to recreate the document from scratch, starting with a new downloaded copy of the file from the Snap Document Assessment page.